QEP Resources Bakken and Three Forks production grew a little less than 1,000 boe/d in the third quarter to average 21,300 boe/d. QEP brought 21 operated wells to production with impressive initial production rates. Ten wells in the South Antelope area came online with a 24-hour initial production (IP) rate of 3,412 boe/d and 11 wells in the Fort Berthold area came online with IPs of 2,588 boe/d. Many of those wells were drilled and completed on mult-well pads. Production didn't grow quite as much as expected due to midstream bottlenecks and shut-ins required by drilling operations. I suspect we'll see relatively strong growth in the fourth quarter. At the end of the third quarter, QEP had drilling operations active on eight well pads (3 at South Antelope and 5 at Fort Berthold). QEP also has an interest in 24 outside operated wells being drilled and is awaiting completion on 22 operated and non-operated wells. On QEP's Fort Berthold acreage alone, the company estimates potential for 420 gross Bakken and Three Forks wells at 160-acre spacing. 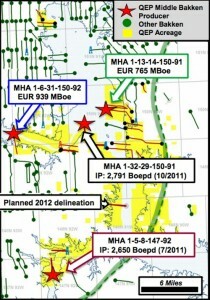 EURs in the Bakken range from 400-650 mboe and wells in the Three Forks are expected to yield 350-600 mboe. That equates to resource potential of 121-202 million barrels of oil equivalent (net) from QEP's Fort Berthold assets alone.